1(a) Find fourth force (F4) completely so as to give the resultant of the system of force as shown in figure. 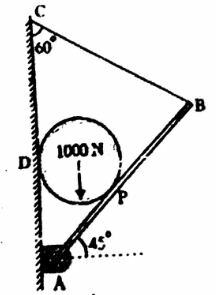 1(b) Determine the magnitude and direction of the smallest force 'P' required to start the wheel W=10N over the block. 1(d) Starting from rest as S=0, a car travels in a straight line with an acceleration as shown by the a-s graph. 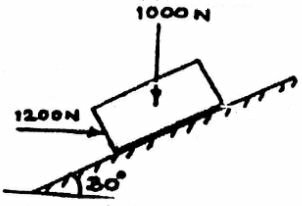 Determine the car's speed when S=20m, S=100m and S=150m. 1(e) Three m1, m2 and m3 of masses 1.5kg, 2kg, and 1kg respectively are placed on a rough surface with coeff. of friction 0.20 as shown. If a force 'F' is applied to accelerates the blocks at $3m/s^2$. What will be the force that 1.5kg block exerts on 2kg block. 2(a) A dam is subjected to three forces as shown in fig. 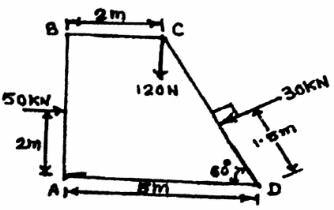 Determine the single equivalent force and locate its point of intersection with base AD. 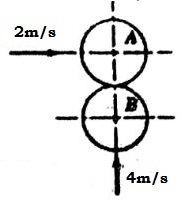 2(c) Two balls of 0.12kg collide when they are moving with velocities 2m/sec and 6m/sec perpendicular to each other as shown in fig. If coefficient of restitution between 'A' and 'B' is 0.8 determine the velocity of 'A' and 'B' after impact. 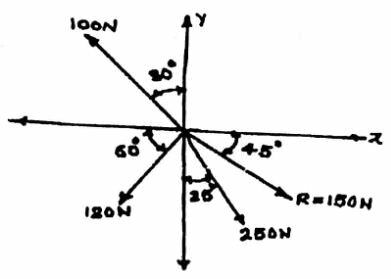 3(a) Find the centroid of the shaded portion of the given area shown in figure. 3(b) Knowing that the tension in AC is $T_2 = 20KN$. Determine required values $T_1$ (tension in AB) and $T_3$ (tension in AD) so that the resultant of the three forces at 'A' is vertical. Also calculate this resultant. 3(c) Fig. 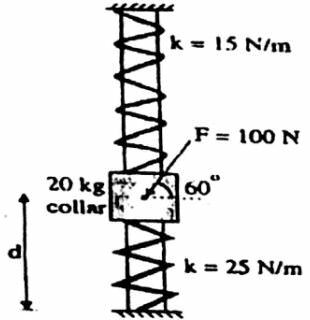 shows a collar of mass 20Kg which is supported on the smooth rod. The attached sprigs are both compressed 0.4m when d=0.5m. 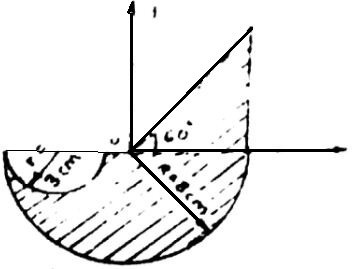 Determine the speed of the collar after the applied force F= 100N causes it to be displaced so that d=0.3m. Knowing that collar is at rest when d=0.5m. 4(b) The motion of the particle is defined by the relation $a = (0.8t) m/sec^2$ where 't' is measured in sec. It is found that at X=5m, V=12m/sec when t=2sec. 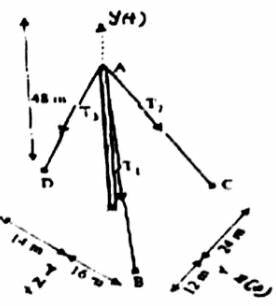 Find the position and velocity at t=6sec. 5(a) A simply supported pin jointed truss is loaded and supported as shown in fig. iii) Find forces in members CD, CG, FG, and CF using method of section. 5(b) A jet of water discharging from a nozzle hits a vertical screen placed at a distance of 6m from the nozzle at a height of 4m. When the screen is shifted by 4m away from the nozzle from its initial position the jet hits the screen again at the same point. 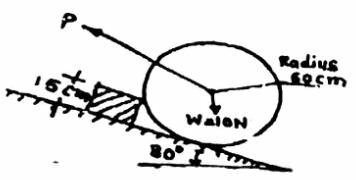 Find the angle of projection and velocity of projection of the jet at the nozzle. 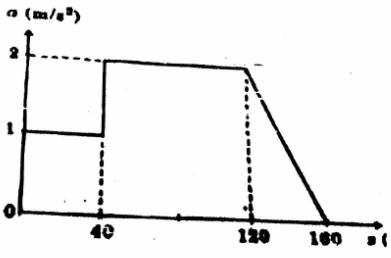 6(b) A horizontal force of 5KN is acting on the wedge as shown in fig. The coefficient of friction at all rubbing surfaces is 0.25. Find the load 'W' which can be held in position. The weight of block 'B' may be neglected. 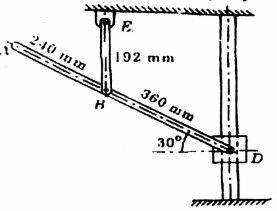 6(c) The stiffness of the spring is 600N/m. Find the force 'P' required to maintain equilibrium such that $\theta=30^0$. The spring is unstretched when $\theta = 60^0$. Neglect weight of the rods. Use method of virtual work. 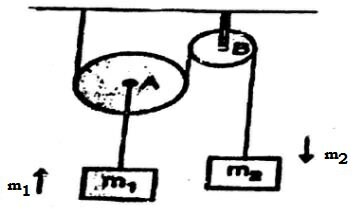 6(d) Two masses are interconnected with the pulley system. Neglecting frictional effect of pulleys and cord, determine the acceleration of mass m2. Take m=50kg and m2 = 40kg.